In order to improve the performance and operational efficiency of businesses worldwide, a customer using SAP wanted to establish a global business program to define and implement a standardized, group-wide business process architecture and associated master data for the parameterization of the group software tools. - Test the application to be sure it could sustain such growth. - Prove the manageability of the solution. - Provide recommendations to optimize the infrastructure architecture. 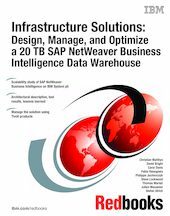 This IBM Redbooks publication describes the testing that was done in terms of performance and manageability in a SAP NetWeaver BI (SAP BW) and DB2 environment on IBM System p™ when scaling a client’s solution to a data warehouse of 20 terabytes (TB). It also provides recommendations for an architecture to support a potential 60 TB data warehouse. The book resulted from a joint cooperative effort that included the PSSC, the IBM/SAP International Competency Center, the DB2-SAP Center of Excellence, SAP AG, and a customer.